We’ve just wrapped up the second and final day of the 2014 Naish Columbia Gorge Paddle Challenge, with Connor Baxter and Annabel Anderson dominating an all-star field in what will surely be remembered as one of 2014’s best events. After their respective victories in Saturday’s Course Race, the Starboard duo made it a clean sweep by claiming today’s unique “Double Downwind” event. 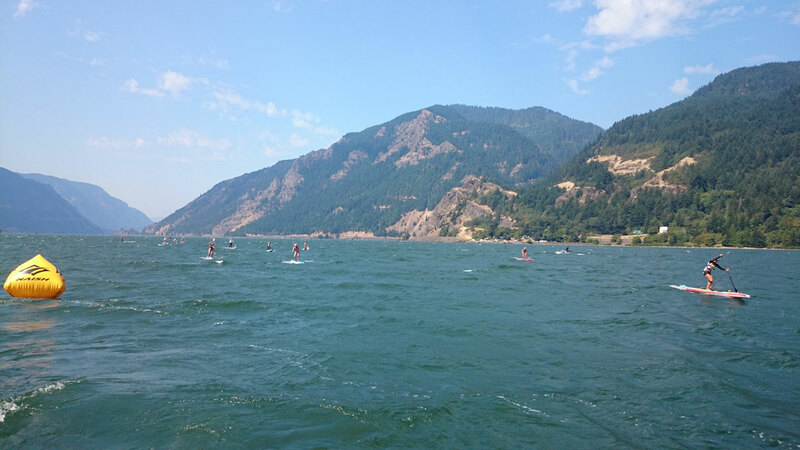 With the winds lighter than usual for the Gorge (but much better than we’d feared last night), the elite field battled their way up the Columbia Gorge in back-to-back downwind runs. The majority of the world’s top athletes were on show today, which gave us some intense racing and a great spectacle (especially from my vantage point out on the media boat). Annabel faced stiff competition from the likes of Angie Jackson and Fiona Wylde, however the Kiwi was too strong on both runs to show there’s no conditions she can’t win in. With two wins today and one yesterday, that’s Annabel’s fourth straight major victory in the span of seven days. Angie was very impressive and finished second overall, despite a course error on the first run costing her valuable minutes and left her with all the work to do on the second run. Local girl (and defending overall event champion) Fiona Wylde was strong and at times kept pace with Annabel, but couldn’t keep up the heroics for the full 8 mile course. Sonni, Candice and Andrea were all up there at one point, but couldn’t crack the top three spots in the combined times from both runs. Also Morgan Hoesterey gets special mention for doing almost the entire second run without her fin… Fighting Spirit Award. In the men’s race it was all Connor. Despite being up against the powerhouse trio of Georges Cronsteadt, Travis Grant and Danny Ching, Connor used every last bit of energy to claim both of today’s downwind runs. Travis, Georges, Danny and Jake were the only ones able to get anywhere near Connor, but the Maui superstar managed to pull away each time he was attacked to win comfortably on both runs. Connor looked absolutely exhausted this afternoon but he can now proudly say he’s won four major races in the past seven days. Connor also took the overall “Waterman Champion” trophy (along with Annabel taking the title of “Waterwoman Champion”), which was based on combined times from the Course Race + Double Downwinder, yet required absolutely zero calculation because nobody passed this guy all weekend. Travis and Georges had a great duel all day, with the Tahitian eventually overpowering the Aussie to claim the runner-up position. Danny Ching was in contention in both downwinders but struggled to hold the pace of the top three during the middle parts of the run. Jake Jensen fell back to 5th on the first leg but came home strongly on the second run to leapfrog Danny into 4th place overall. One of the pre-event contenders, Kai Lenny pulled out from the event this morning citing exhaustion from his hectic travel schedule (as well as perhaps from babysitting 200+ kids on Friday afternoon at the Positively Kai event). The racing has literally just finished and we’ve got an SIC after party to get to, so full recap, results and pics coming soon. 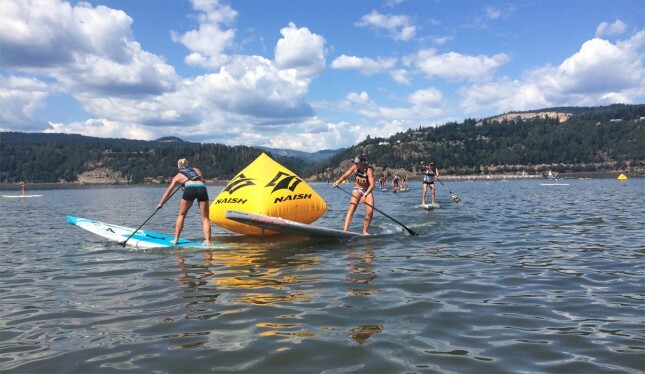 Day One of the Naish Columbia Gorge Paddle Challenge is over and it was a familiar sight on the podium this afternoon, with Annabel Anderson and Connor Baxter winning the women’s and men’s Elite Course Races respectively. 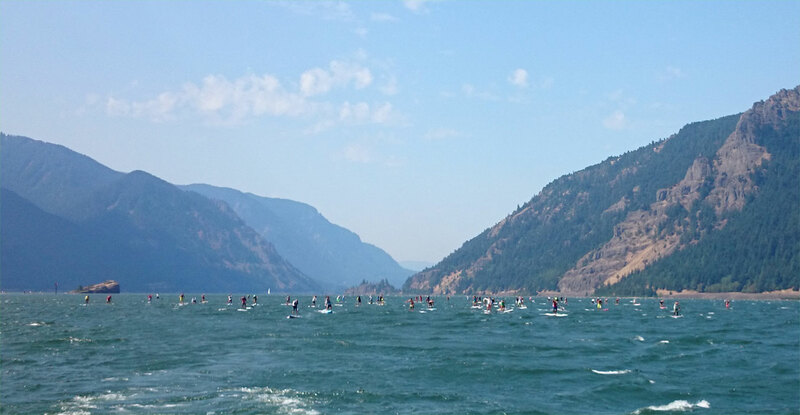 On a sunny, hot, windless day here in Hood River, Oregon, most of the world’s best paddlers lined up at the start for the 5-lap, 5-mile course race. After first the Super Groms and then the Junior and Open Women and Men had entertained the crowd, after lunch it was time for the big guns to take over. 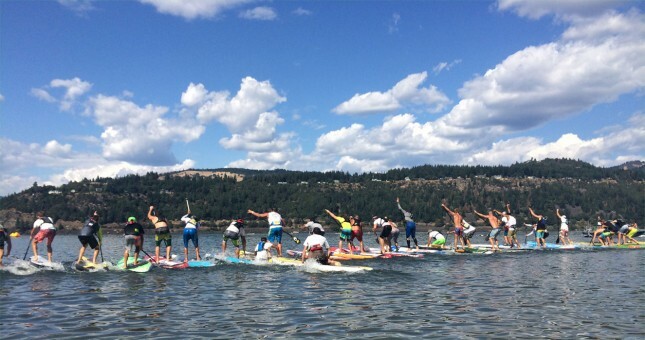 This event will probably go down as the single most competitive race ever held outside of Dana Point, with a virtual who’s who of the paddling world in town for the 4th annual Gorge Paddle Challenge. Set against a beautiful backdrop of a wide open river and beautiful mountains, the Gorge race lived up to its pre-event hype by delivering an absolute cracker of a contest between all-star athletes such as Annabel Anderson, Candice Appleby, Lina Augaitis, Danny Ching, Connor Baxter, Travis Grant, Georges Cronsteadt and Kai Lenny. Pretty much all the big names were in town and the assembled crowd down here at the Hood River Waterfront Park were treated to quite a show. Flat water racing isn’t always the most interesting affair, however this year’s Gorge Course Race won’t soon be forgotten. The very cool “Athlete Introductions” that kicked off proceedings (where each entrant was introduced one-by-one) were a novel touch and a good sign of the entertainment that was to come out on the water. First up it was the women’s race, where Candice Appleby flew out of the gates to set the pace on the opening lap. Going with her was Lina Augaitis and Annabel Anderson, while Fiona Wylde, Angie Jackson, Sonni Hönscheid, Shae Foudy and Shannon Bell were dropped towards the end of the first round. Candice pushed hard early and clearly had a point to prove, however it was almost inevitable that Annabel would take over at some point. That happened about one third into the race, when the hard-training, no-fuss Kiwi put the hammer down to first pass, then gap the former BOP Queen Candice. Lina Augaitis had been bravely hanging on to the lead two – losing ground at each buoy turn (not Lina’s strong point) before sprinting to get back on their tail in the flat stretches – but didn’t have the speed or stamina to go with Annabel. 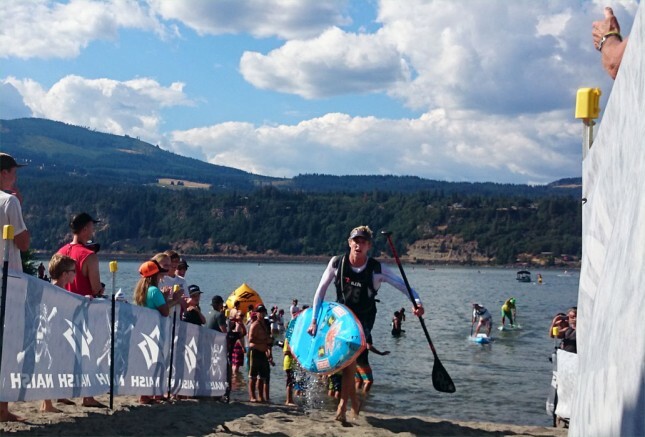 Post by Columbia Gorge Paddle Challenge. By the mid way part of the race the result was clear: Annabel had established a strong gap and didn’t look back. The lead was around 30 seconds by the start of the fourth lap and would stay that way until the end. Candice and Lina were locked in a close tussle for second, however Candice’s fast pace early eventually caught up with her: Candice started tiring, Lina started surging and the first three positions were decided halfway through the final lap. It was an all-star performance from Annabel Anderson, cementing her position as the undisputed #1 woman in the world, just six days after she showed her class at Waikiki to win the big Showdown event. Angie and Sonni worked hard to try and close the gap, while Shae bravely held on to their tails for much of the race. It was a long, hot, grinding affair out there today, so hats off to everyone that zipped around the course with so much determination. Behind the leading trio it was a great battle for 4th: Molokai champ Sonni Hönscheid was going back and forth with Aussie star Angie Jackson, while young up-and-comer Shae Foudy bravely hung on to their tails. Eventually the older duo dropped the youngster, before sprinting to the line where Sonni just pipped Angie for the 4th step on the five-woman podium. Coming home in 7th place was local hero and defending event champion Fiona Wylde, with Canada’s Shannon Bell in 8th and Alyson Fromm, Jen Lee and Kelsa Gabeheart rounding out the elite field. After the women had finished it was straight into the men’s race. This was always going to be an epic battle, with at least two dozen world-class contenders on the start line. As the horn went it was Danny Ching taking the early lead, rounding the first buoy ahead of Jake Jensen and Kai Lenny. Pre-race favourite Connor Baxter had a shocking start, relegating himself to 15th or 20th in the opening seconds and having to quickly fight his way back through the pack. Within the first kilometre the lead 20-30 guys had started forming into a train. Danny looked strong out front, Jake Jensen was holding his wash while Travis Grant moved up into a safe third position. One of the other big favourites, Tahiti’s Georges Cronsteadt, was sitting comfortable in 4th or 5th for much of the opening stanza. However the big surprise early was the performance (or lack of) from Kai Lenny. Definitely one of the pre-race contenders, Kai was perhaps feeling the effects of babysitting 200+ kids the night before (courtesy of his Positively Kai event), falling from third to fourth to fifth to sixth to seventh to eight… Before eventually being dropped by the lead group of seven guys. It was quite a sight to see this young superstar hitting the wall so early. I’m not quite sure what happened but Kai looked absolutely spent by the end of the first lap. Amazingly, he fought back over the next 45 minutes to hold his position inside the Top 10 – it was almost as if he ran out of gas early before gaining a second wind. So after the first of five laps the race was set: There were seven guys in the lead pack (Danny, Jake, Travis, Connor, Georges, Kody Kerbox and Arthur Daniel), with another six guys chasing (Kai Lenny, Slater Trout, Paul Jackson, Chase Kosterlitz, the #1 Dark Horse – Bruno Tauhito from Tahiti and Fernando Stalla, who had to fight hard to connect with the second group after a horror start put him well down the order). Behind those top 13 there was a 20-man battle for the minor placings inside the top 20. Such was the depth of this field that at one point we were calling big names such as Riggs Napoleon as sitting outside the top two dozen. It was a huge effort from the four big guns (Connor, Danny, Travis and Georges – I’d usually throw Kai in there as well but he was having an uncharacteristic race today), while Jake Jensen showed his potential in the first four laps, Kody showed he’s the defending champ for a reason and Frenchman Arthur Daniel surprised everyone (except for everyone in France) by sticking with the leaders for 90% of the race. During the middle stretch of the battle little changed: The top seven guys held their form while the next group of six chasers tried everything but couldn’t close the gap at all. The distance was at a good minute by the time they hit the final round and that’s where it got interesting. There was a crazy snake quite literally filling the entire course, with the leaders eventually lapping some of the backmarkers and paddlers spread out all around the 1 mile, 7-buoy course. They were even spread out onto the sidelines, with Noa Ginella unfortunately retiring hurt on the second lap, though as a consolation he had one of the best possible views of the race, opting to stay out on the course, sitting on his board and watching his mates go flying by each lap. 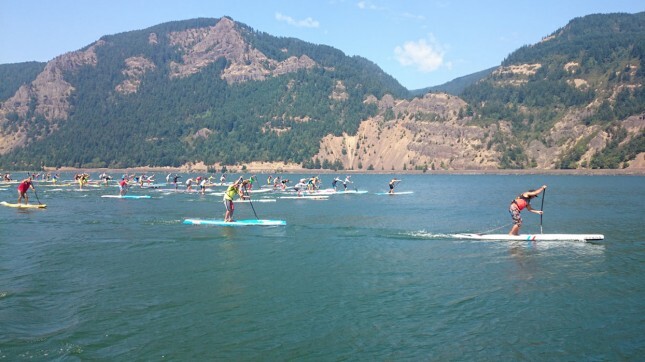 As the paddlers rounded the inside buoys on this unique flat water course here in the Gorge, to signal the start of the final lap, everything went haywire. Groups started splintering, train drivers started getting overtaken by their passengers and the whole rhythm was suddenly broken. In the front group it was still Danny Ching setting a mean pace, however on the back straight of the final lap we saw Connor Baxter and then Travis Grant make attacking moves. Connor eventually wrestled control of the lead from Danny and Trav with about 600 metres to go. At this point we saw Arthur get dropped, the Frenchman’s brave campaign finally coming to end. Shortly thereafter young Jake Jensen from Australia lost contact with the leaders, whittling the lead pack down to five guys (Connor, Danny, Travis, Georges and Kody). Kody Kerbox was supremely impressive out there today. He won the overall Gorge Paddle Challenge title twelve months ago but that was against a much shallower field. I don’t think many pundits had given Kody a chance going into this weekend, however I for one was stoked to see the Maui youngster going toe-to-toe with the worlds’ best. As the lead five rounded the fourth last buoy of the race, Danny Ching was hit from behind by Georges Cronsteadt, throwing the fluro green-hatted man into the water and allowing Connor to make a fast break. Travis Grant went around the outside of the carnage while Kody went up the inside. At one point Kody actually sprinted into second position, however he may have made his move too soon, eventually tiring and being passed by Travis, Danny and Georges. But Connor didn’t tire and he never looked back, making the most of his slight gap to sprint away from the field over the final few hundred metres. For the second time in six days, he would stand atop the podium with his Starboard teammate Annabel Anderson to share a hard-fought victory over the world’s best paddlers. Behind Connor there was a sprint for second: Travis and Danny were side by side with 100 metres to go, however Travis milked the tiniest of bumps on the ride home to claim the runner-up spot by a single board length. Georges Cronsteadt was right behind those two in 4th spot, showing he deserves his spot among the Big Five, while Kody Kerbox came home for a well deserved 5th place. Jake Jensen held onto 6th while Arthur Daniel remained in 7th, with a fast-finishing Chase Kosterlitz breaking the second pack on the final lap to take 8th. Kai Lenny and Slater Trout had gone back and forth over the second half of the race, with the two locked in a sprint to the line. Eventually it was Slater who edged ahead, with Kai crossing in 10th place and perhaps feeling the effects of his incredible, rockstar-like travel schedule this past year or two. Coming home 11th was Paul Jackson, who had an excellent race and finished well ahead of several of his close rivals. Jacko puts more effort into his paddling than just about anyone, so it was good to see him rewarded with a finish close to the front groups. Behind Jacko it was the absolute dark horse of the event, Tahiti’s Bruno Tauhiro. Bruno is a complete unknown in the stand up paddling world, however he’s a borderline god in the world of outrigger, being one of the lead paddlers for the almighty Shell Va’a team (basically the dream team in the world of six-man outrigger racing). Bruno did show his freshness to the world of SUP racing though: He was slow around the buoys and didn’t seem to enjoy wash riding (drafting), instead sitting off to the side in his own clean water. But the fact he did most of the race on his own and still held the pace of the big guns, without drafting, showed us just how scary it’s going to be when the Tahitian outrigger paddling machines decide to cross over into stand up. In 13th it was Fernando Stalla, who’d fought hard on the opening two laps to connect with the second pack but had clearly spent too much in doing so. Not far behind was Fernando’s Sayulita comrade, Javier ‘Bicho’ Jimenez, who’d been locked in a no-mans-land battle with Thomas Maximus and Andrew Logreco for much of the race. Behind that trio were another 15 guys battling for the final few spots inside the top 20. This really was a massively stacked field: Making the top 10 was a huge achievement; hell even making the top 20 deserved a medal. Outside of the Battle of the Paddle, I’d say this was the most competitive men’s SUP race ever seen. Actually not even half of it: The Course Race represented just one-third of the overall Gorge Paddle Challenge event, with tomorrow’s unique ‘Double Downwinder’ helping decide the overall event standings. However if the wind is as light tomorrow as it is today, there will be an inevitable change to the format. The Columbia Gorge here in Hood River, Oregon is famous for its winds but it was dead flat out there today. Hopefully the wind starts macking in the morning, but if not the organisers are in for a tough decision: The Double Downwinder will be no fun if it’s 2x races up-stream against the current (downwinders here in the Gorge quite literally go up-stream). While we’ll all be crossing our fingers the forecast is 50/50 at best, so I guess we’ll wake up in the morning and see how it looks. My call is we’ll see a single downwinder run in the early afternoon when the winds pick up somewhat. Until then our big congratulations go out to Connor Baxter and Annael Anderson, who once again showed they’re virtually unstoppable. But it’s not all over: Times from all three races will be combined, so the guys and girls currently filling the minor placings still have a chance to make up the ground. So if you wanna see how it all unfolds tomorrow (Sunday), then tune in for our LIVE BLOG presented by Quickblade Paddles at around 11am local time (Pacific Time).